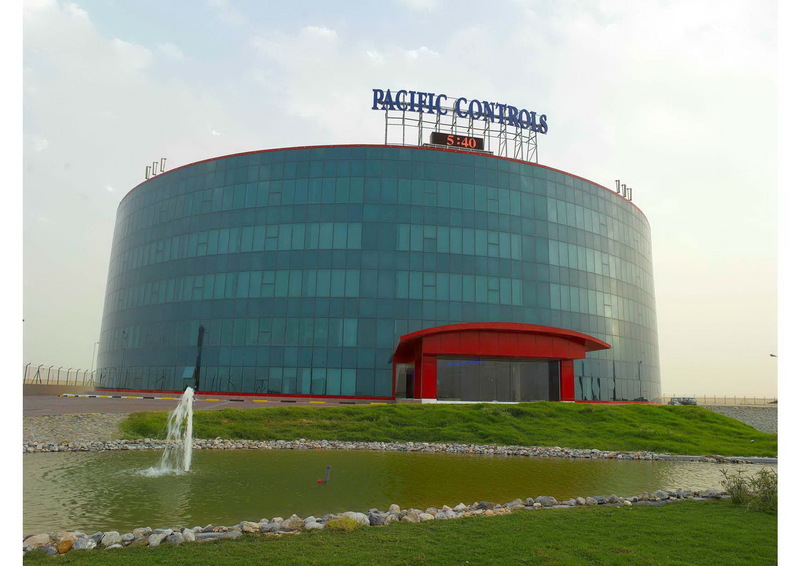 Pacific Control Systems, an automation company with operations around the world, today inaugurated its headquarters in Techno Park, Dubai. 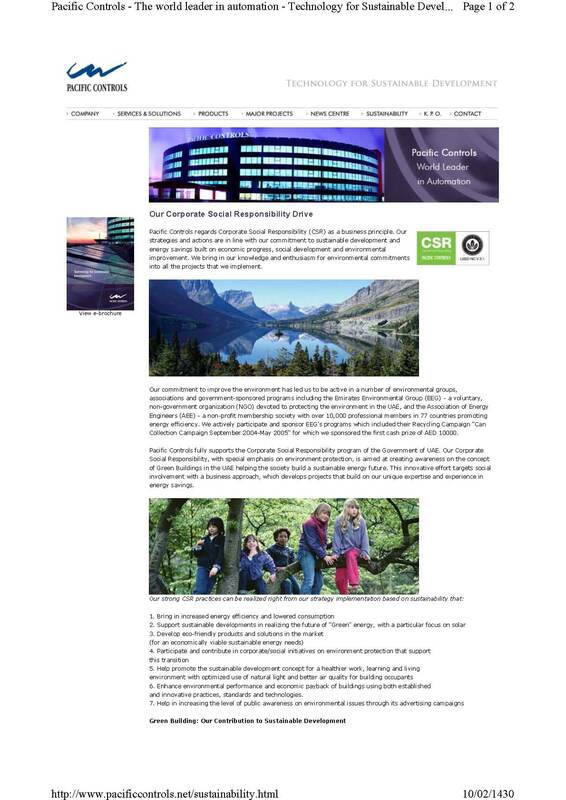 The headquarter building is the first Platinum rated green building accredited by the US Green Building Council (USGBC) Leadership in Energy and Environment Design (LEED) programme in the Middle East and sixteenth in the world. H.E. Mohammad Al Gergawi, Minister of State for Cabinet Affairs of the Federal Government of the United Arab Emirates and Executive Chairman of Dubai Holding, inaugurated the building. Mr.Jamal Majid Bin Thaniah, Vice Chairman of the Board of Ports and Free Zones, Group Chief Executive Officer Ports & Free Zone World & Vice Chairman DP World, spoke during the occasion. The inauguration event was also attended by Ms. Salma Hareb, CEO Jafza and Economic Zones World, Mr. Sami Dhaen Al Qamzi, Director General Department of Finance, Brigadier Rashid Thani Al Matroushi, Director of Dubai Civil Defence, Mr. Marwan Al Qamzi, Managing Director, Dubai Waterfront and Jebal Ali Palm, Ahmed Abdul Hussain, CEO of EHS, Mr.Jamal Lootah, CEO Imdaad, and other senior officials and dignitaries. Mr. Sandy Wiggins, Chairman, US Green Building Council, delivered the keynote address at the event. Commenting on the inauguration of the headquarters, Mr. Dilip Rahulan, Chairman and CEO, Pacific Controls, said: "We are proud to unveil our headquarters today. Our headquarter building is built in line with our commitment to the UAE government's drive towards achieving sustainable development in the region. It is our belief that our initiative will set a new benchmark for other green development projects in the UAE and elsewhere, demonstrating our commitment to environmental stewardship and Corporate social responsibility." The award winning headquarter building has achieved LEED certification from the USGBC, accumulating a total of 55 points. The Green building has already won two international awards one at Boston in June 2007: as the "Extreme Office Building in the world", "Digie Award" against Taipei 101 and Shanghai Financial Centre; and the Best Intelligent Building in the World in, Chicago Buildcon 2007. 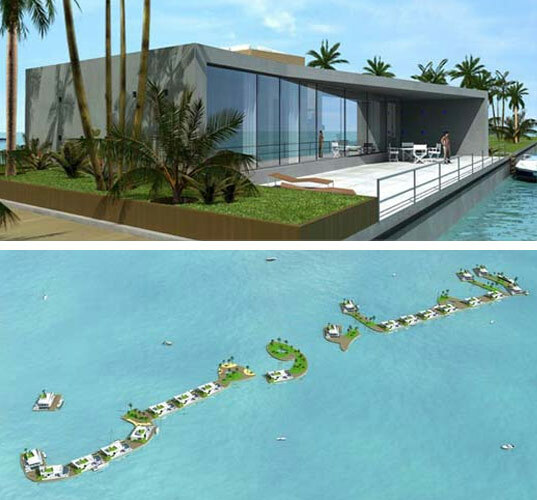 In his concluding statement Mr. Dilip Rahulan, Chairman and CEO, Pacific Controls, announced that Pacific Controls is now looking beyond Platinum Green Buildings and will Pioneer the process of building the Worlds first "Living Building", as its Research and Development Centre in Dubai. Pacific Controls (the global leader providing total automation solutions) has showcased its new Green Building headquarters in the Ninth Special Session of the United Nations Environment Programme (UNEP) Governing Council/Global Ministerial Environment Forum's exhibition inaugurated by His Highness Sheikh Mohammad Bin Rashid Al Maktoum, Vice-President and Prime Minister of the UAE and Ruler of Dubai along with Klaus Toepfer, Executive Director of the UNEP, at the Dubai International Convention Centre. 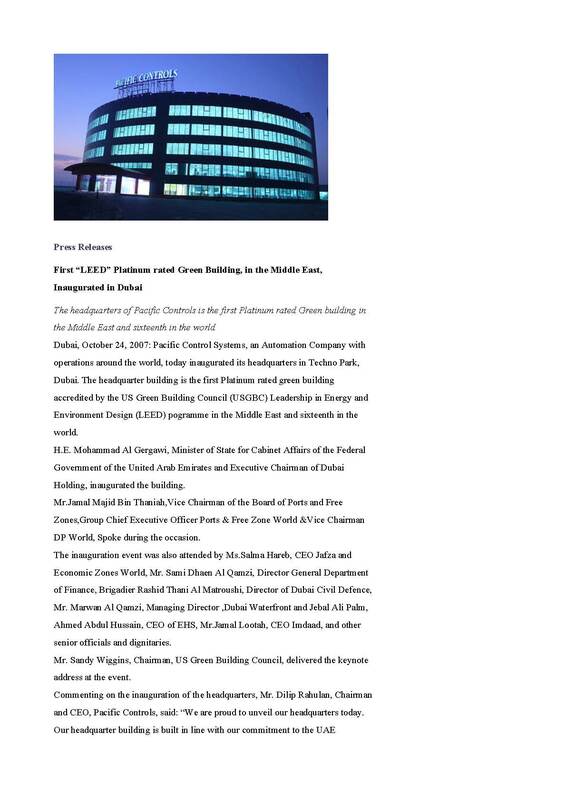 Pacific Controls is aspiring to achieve the LEED Platinum rating for its 5-storey headquarters located at the Dubai Techno Park, which meets all the criteria set by the LEED Certification Program after having undergone rigorous processes of design and implementation strategies. Pacific Controls has appointed Confederation of Indian Industry (CII), Government of India as its consultants for the certification program. Spanning an area of 200,000 sq. ft., the building to be operational in April 2006 will showcase the 100 KW use of solar energy for lighting and solar-thermal for 100 Tons of air-conditioning. Dilip Rahulan, Chairman and Chief Executive Officer of Pacific Controls, said, "Our investment in the green building is our commitment to sustainable development projects to showcase the use of alternative energies in commercial buildings." "We fully support the vision of the Government of Dubai regarding sustainable development and the use of alternative energy, and our iconic project will put Dubai on the international map of Green Buildings," he added. The environment-friendly design and engineering of Pacific Controls' green building emphasizes on the key features of sustainable site development, water and energy efficiency, recycled or recyclable materials selection and indoor air quality leading to improved health, comfort and productivity. 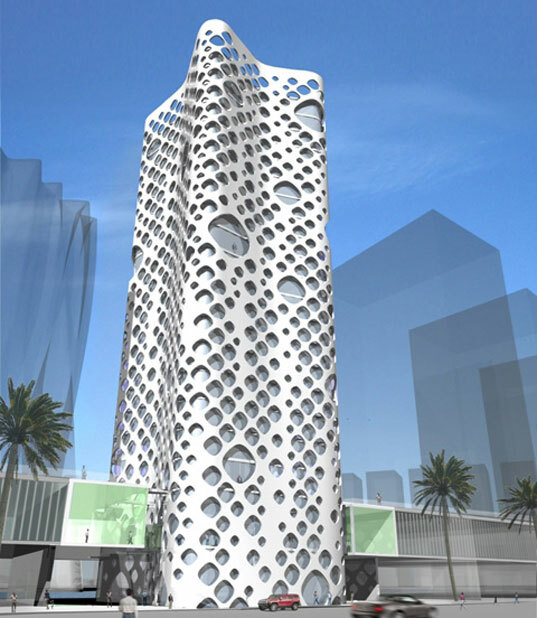 The green building houses a Research and Development (R&D) center serving as the "Center of Excellence" for automation business in the Middle East, which will also develop eco-friendly automation solutions and products for the global markets. 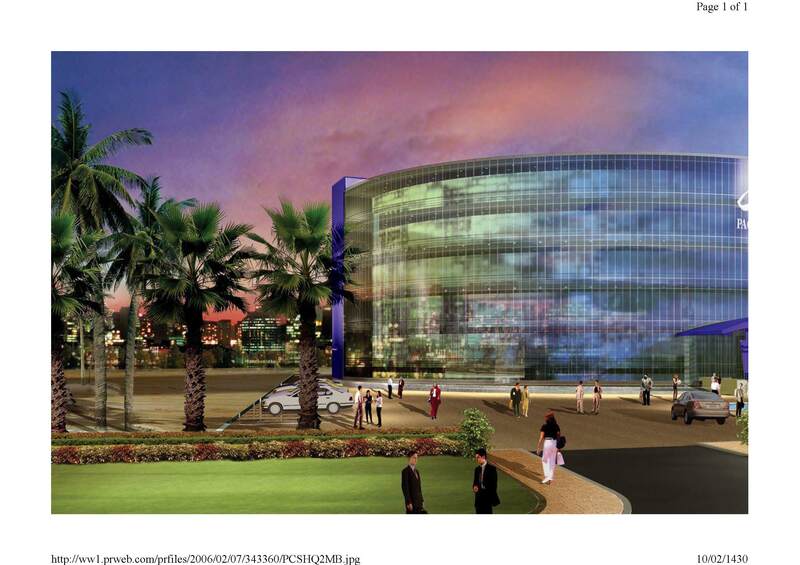 The building will also have 24x7x365 days Command Control Center (CCC) providing services on monitoring and control of assets for Government and Private sectors. Commenting on the forum, Rahulan stated, "The UNEP forum is being held for the first time in the Arab world with more than 130 environment ministers representing 160 countries globally, and we are happy to participate in this exhibition which is instrumental in raising the awareness on environmental protection." Pacific Controls brings in knowledge and enthusiasm for environmental commitment into all the projects that it implements focusing on energy savings. Pacific Controls is actively involved in a number of environmental groups, associations and government-sponsored programs including the Emirates Environmental Group (EEG) - a voluntary, non-government organization (NGO) devoted to protecting the environment in the UAE. As part of its "Green" initiatives, Pacific Controls is running an advertising campaign in the city with the theme, "Our Commitment to Dubai: "Intelligent Green Buildings", the first in a series of its kind to be launched by Pacific Controls across the United Arab Emirates (UAE). This campaign marks Pacific Controls' participation in line with the Dubai Government's drive in making the Emirate a cleaner and green city in the UAE, and the need to go for solar to meet the growing energy demands. 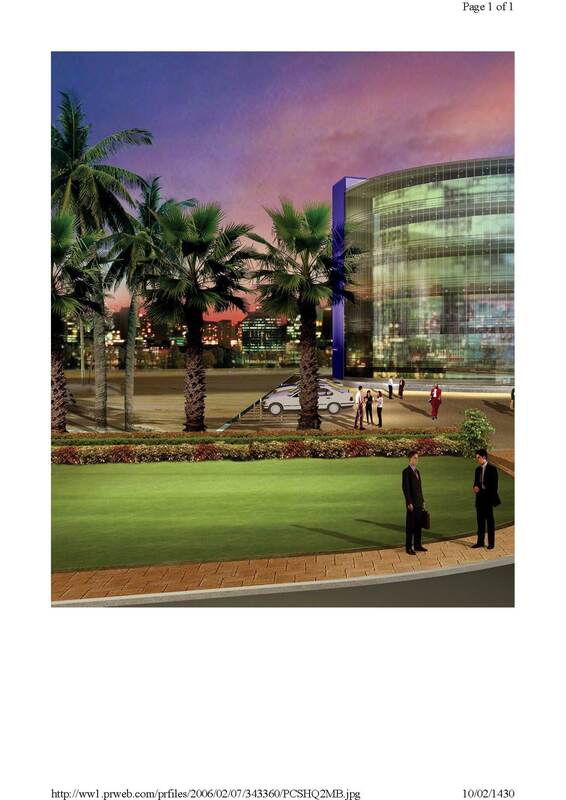 "With the construction boom, it is essential to encourage the people of Dubai, both corporates and the public, to participate in the environmental initiatives taken by the Government, and the need to join hands through a private-public partnership for a green Dubai," pointed out Rahulan. Spearheading the green concept in the UAE, Pacific Controls' iconic headquarters is at the forefront of the UAE's Green Building movement, serving as a showcase for future green buildings in the region. The event witnessed the award ceremony of Kofi Annan, United Nations Secretary-General who was honoured with the top price of Global Leadership, the Zayed International Prize for Environment, for his commitment to sustainable development. "The launch of the building will set a new trend in the vibrant Construction industry in the Middle East to adopt the concept of Green Buildings," concluded Rahulan. Form truly follows function when it comes to the façade of the lean green O-14 (pronounced “oh-14″) office tower which broke ground this past December in Dubai. 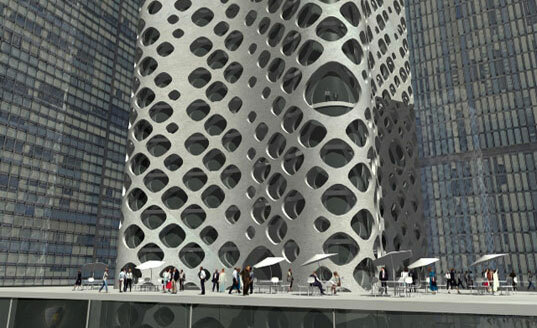 At 22 stories tall, the 300,000 square-foot commercial tower’s most unique feature is its façade, which is made of 16″ thick concrete containing over 1,000 circular openings. As global leader of the bizarre world of upscale development, Dubai has yet another feat of both engineering and excess in the works. The latest spire to be added to the desert landscape will be the Time Residences building in the City of Arabia, a 200-unit apartment tower - that will rotate! The complex will turn a full 360 degrees over the course of a week, utilizing stored solar energy to power the turning mechanisms. Sitting on a high-tech bearing system, the 80,000 ton building will rotate using solar power that will be stored and distributed from a power plant in the base of the building. In addition to the 5mm/second rotation, it will also feature a timepiece down its length, allowing onlookers to gauge the hour by studying the constantly-changing façade features. Although this is one more example of Dubai pushing extravagance for extravagance’s sake, we are somewhat consoled that the uniqueness of the project is derived from a renewable energy source; it’s just too bad that sustainable power will be wasted on such a superfluous feature. 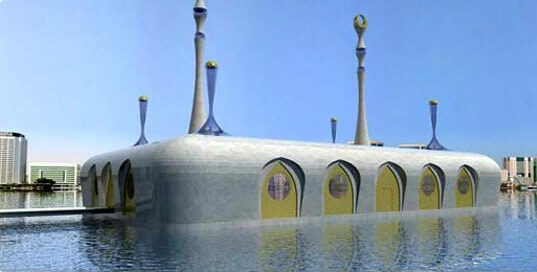 The $109 million dollar project is expected to start in June 2007. 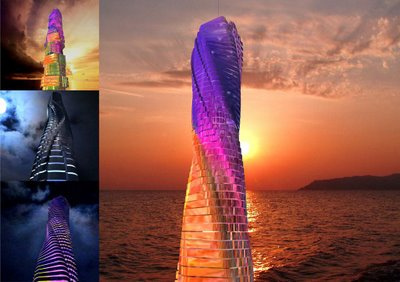 The Da Vinci Tower (also known as Dynamic Architecture Building) is a proposed 313 m (1,027 ft), 68-floor tower in Dubai, United Arab Emirates. 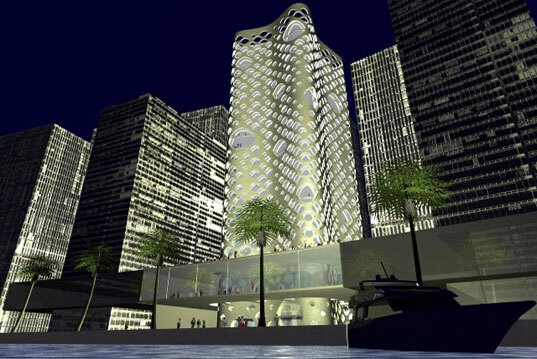 The tower is expected to be architecturally innovative for several reasons. Uniquely, each floor will be able to rotate independently. 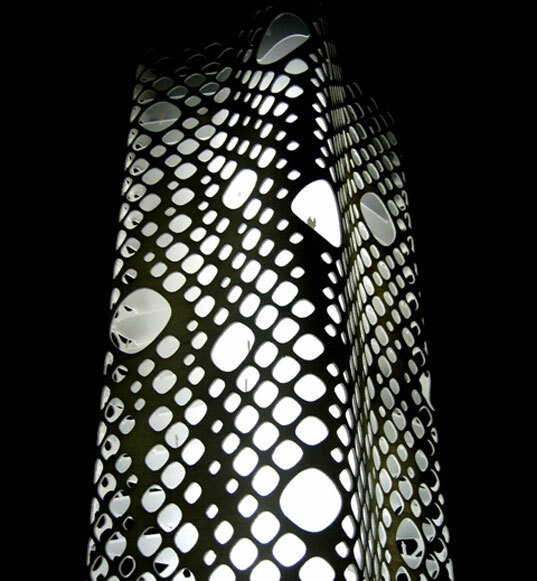 This will result in a constantly changing shape of the tower. 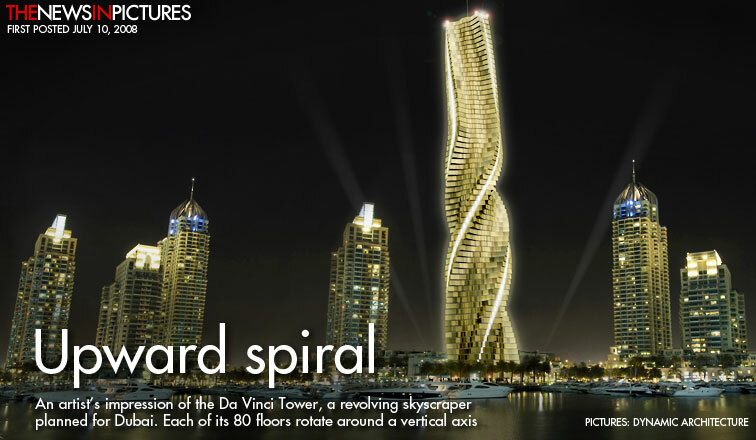 Each floor will rotate a maximum of one full rotation in 90 minutes. 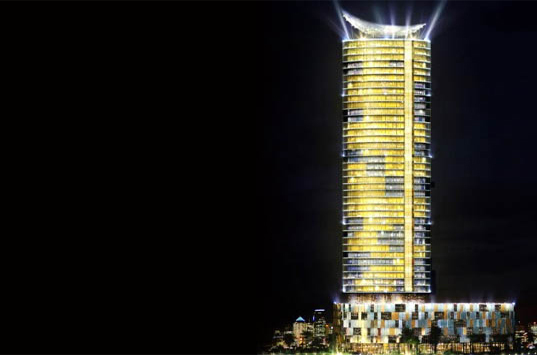 The entire tower will be powered from turbines and solar panels, and five other buildings in the vicinity will also be provided with electricity. 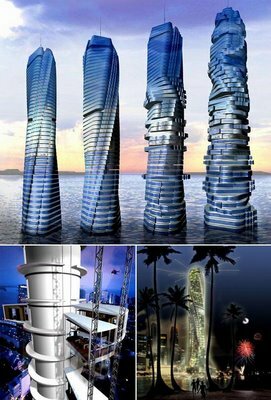 The turbines will be located between each of the rotating floors. They will generate 1,200,000 kilowatt-hours of energy from the movement of the floors, and the solar panels will be located on the roof. Construction of the Da Vinci Tower is expected to be completed in 2009. Designed by the Atkins group, the 400-meter office tower aspires to reduce its total energy consumption by up to 65% and water consumption by up to 40%. To achieve this goal the building makes use of extensive passive solar architecture, and many low water engineering solutions including recovery strategies for both energy and water. During the development of the design Atkins will map and manage the embodied energy content of the building and select materials from sustainable sources, so that impact on global resources is controlled. Already, this is leading designers to consider a steel frame solution for this structure. 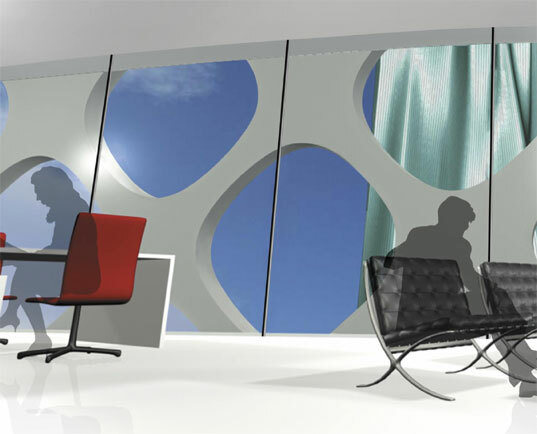 Additionally, features such as floorplates interconnected by micro-atria and the inclusion of inter connecting vertical gardens are being actively considered to enhance the social aspects of this building. According to Atkins, this unique building, with a total construction area of 140,000 sq m, will become a working prototype for low carbon towers within the region and a model for more sustainable developments in the future.